I actually feel kind of bad for Brantley Gilbert. His heart is totally in the right place. But the execution is absolutely horrendous. Attempting to tackle two different tragedies in one song – a fallen soldier and death by cancer – and fails to stumble upon any truth in either individual situation, let alone a compelling connection between the two. His monotonous delivery doesn’t help matters, but the song was beyond saving anyway. I know some people will find this review and think I’m heartless or not patriotic or what not. To them, I recommend the following two songs to listen to. Heck, I’ll even add the videos at the end. “Dearly Departed Friend”, by Old Crow Medicine Show, where a man attends the small town funeral of his best friend, a soldier killed in battle. “Elephant”, by Jason Isbell, where a man reconnects with an old flame and cares for her in the final throes of her battle with cancer. The real thing is out there. Accept no substitutes. Perfect choices of counter-examples to prove that there are contemporary artists who are capable of writing exceptional songs about these subjects. Gilbert, a mediocre songwriter and appallingly poor singer, is not among those artists. Agree that there’s no questioning the sincerity, but there’s plenty of faulting the technique. He just looks like a poser. I know it is not right and proper to judge on appearance, but for gosh sakes, the earrings and rings screams would-be rock star. When did country music become the dumping ground for this breed? Joey and Rory’s “To Say Goodbye” dealt with two tragedies with no compelling connection, 9/11 and alzheimer’s. It was, as your 2009 review pointed out, an understated treatment and received an A. BG’s “A Hell of an Amen” is not the equal of “To Say Goodbye” but the D rating does seem a bit harsh. I think it’s quite a bit better than the Chase Rice song just reviewed which I think deservedly got a D. . Elephant is the new standard barer in all of music for songs that deal with a human being who is dying of cancer. There has not been and likely will not be for a while, a song as powerful and emotive as what Isbell penned in Elephant. I’d also like to add “When I’m Gone” by Joey + Rory to the list of suggestions for Brantley Gilbert and his team. While that song isn’t specifically about cancer or a fallen solider, it is a very touching song that deals directly with the death of someone you care deeply about. I agree that the OCMS and Isbell songs are superior. I’m actually torn on this song, on one hand I can appreciate Gilbert releasing a song that breaks away a tiny bit from the super macho, Bro-Country style he and others have ridden to stardom. On the other hand the lyrics are just SO cliche it kills any possible good feelings I have about the song. I would probably give it a C- rather than a D, just because it’s better than his last couple singles and the subject matter at least tackles something non-truck/girl/beer related, but I think a song like “I’m Gone” would have been a better pick for a “substance” single just from a quality standpoint. Not a lot to choose from on that album in the quality sense, but that song is not terrible lyrically at least. I don’t hate this song lyrically. It’s Brantley’s awful vocal delivery and the overblown rock production that turns for me what could have been a C song in the hands of another artist into a D- one here..
Couldn’t agree more with Kevin’s review. There is a right way to tackle these topics in music- with the subtlety and humanity they deserve. Then there’s this. Most of the other “bro” acts at country radio today have at least one feature I can find redeeming. Luke Bryan really can sing, Jason Aldean stumbles into good taste now and then, and hell, even Florida-Georgia Line have put out a guilty-pleasure earworm or two. 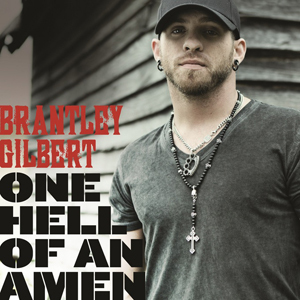 But there is just nothing about Brantley Gilbert I can find to like. He’s at the bottom of the barrel for me. He’s so bad I can’t even bring myself to really hate him. He’s just there. The other problem I have had about a lot about these solo “bro country” boys, besides the misogyny (blatant or otherwise) in the lyrics or the songs, is that basically they same a Xeroxed image: baseball cap; beard/goatee; sunglasses; some kind of redneck smirk on their faces. Exactly what are they trying to prove? That they are bad-a** or something? It’s now nothing but a cliché and a stereotype–much like the songs they choose to record and have hits with (IMHO). And yet he sells a lot of music. Someone out there finds his posing real and his vocals and songs appealing. Poor fools. It’s like when FGL released Dirt. The fact that he’s trying to sing about something “real” just makes the shoddy execution and lyrics even worse.